Michael Buerk is joined by chef Paul Ainsworth to celebrate royal food inspired by the days of India and Empire, using recipes hidden in the royal archive. Browse content similar to India and Empire. Check below for episodes and series from the same categories and more! because we've got it in her own hand. Now, the Queen Mother had this really wicked trick with these. -That is what you want. and turbot dressed in a lobster champagne sauce. Hello. I'm Michael Buerk and welcome to Royal Recipes. built in the style of a royal palace and once owned by a king. the only surviving recipe book of its kind in the royal archive. which is kept at Windsor Castle. we'll be bringing these recipes back to life. still enjoyed by today's young royals. got us all hooked on Indian food. to elevate curry to something that truly was fit for a queen. to create dishes for the Indian President. and the royalty as well. And chef Paul Ainsworth cooks up curry, Prince Harry style. Prince Harry had this stuff when he was serving in Afghanistan. And the Gurkhas, they'd cook up fiery goat curry. and the Indian dishes served on her menus. -Two... Bah! Two British greats. Queen Victoria and the Indian takeaway. to the popularity of the other. She loved curries, didn't she? -And you're going to cook one of her favourite recipes. and it's absolutely delicious and really simple. it's "cailles aux pommes de terre a l'indienne". They don't call it that, I have to say, at the takeaway. is we're going to get going straightaway with a lovely base. So, we've got some onions that we've cooked in butter, ghee. and the temperature gets nice and hot. we want to really cook that curry powder out. -But you're using curry powder? -Bit of a cheat, isn't it? we're making our base from scratch. turn that heat up a little bit and really get going. Some grated ginger, absolutely delicious, nice and fragrant. Just going to grate that in there like so. But the key to it is the sauce, isn't it? which I think means sauce. because we've got that wonderful flavour. Bring that to the boil. And then we're going to add the legs, Michael. but they need cooking before the breasts. because they're the bit on the animal that work the most. And that's it, that's our sauce. hour and ten minutes, and those legs would be beautiful and tender. It's pretty exotic for royal food, isn't it? -It is, it really is. really had very exotic tastes. because she liked all this kind of stuff! Well, and it really is a delicious recipe. gentle simmer, these are our legs that we've done earlier, OK? and what's beautiful is that now we've got this lovely sauce. So, can I get you to grate me an apple, please? -Yeah? Peel it and then grate it. -A position of trust, this. I'm going to add in my beautiful quail leg meat. -We're going to add in our breasts. just let it down with a little bit of water. -You're using water all the time rather than stock, aren't you? and sometimes you don't want to confuse flavours. We're going to add in our potatoes. Now, these potatoes have just been partly cooked. What about the breasts, how long do they take? Breasts will just literally take a couple of minutes. -Yeah, because they're so thin. And the potatoes are just taking on that wonderful flavour. It is perfectly done, absolutely! especially a lovely English apple like this, like the Bramley. It's a beautiful, clean taste, isn't it? And, look, the juices of the apple as well. It really is a delicious curry. Now, that there is cooked, believe it or not, we are cooked. Those breasts are cooked? Just a couple of minutes. As quick as that, just a couple of minutes. You've got two pots on there, Paul, what's in the mystery one? so in here, we've got some wonderful spinach, a pinch of salt, butter. as a lot of vegetables, over 80% water. -You don't put water in first? and you can see, we'll just turn it over - see that, Michael? And it's just literally wilting down. Delicious vegetable, spinach. Full of iron. so we've got some wonderful, just some wonderful steamed rice, OK? -Yeah, let's chop some coriander. Let's chop some coriander and we're good to go. -That bit of finger that you chopped off. and let's plate up. If you just stir that in gently for me. -I'm going to get the side dishes ready. So, we've got our wonderful steamed rice, our lovely spinach. It's good to be right over it, isn't it? Absolutely. OK. Let's plate up. -So, we're going to have some lovely spinach. Do you do much Indian food yourself? Do you know what I love about Indian food? So, we've got that lovely rice. is kind of inherited from the subcontinent? This is my favourite style of curry. I mean, look at that! -You don't want it sloshing around? No, you don't, you don't. does that mean that they're going to taste like different meats? will be just almost like a steak texture. -Are you ready to taste? See those potatoes? Just slightly soft as well. Nice bit of breast there on top. And that lovely deep green spinach. Do have some yourself, Paul. Thank you. That's very kind of you! Oh, it's good, isn't it? I keep saying it, but it's the acidity. -It's those tomatoes, that apple. Yeah, yeah. There is that, yeah. A lovely bit of acidity with it. -because they've just sucked up all that flavour. Would Queen Victoria have approved? Queen Victoria would have been amused. Queen of England and Empress of India. the royal family's retreat on the Isle of Wight. it's here that she chose to showcase the imagined glamour of the Raj. Queen Victoria never actually went to India. and give her entertaining space. as I ogled all this incredible decoration. full of elaborate Indian craftsmanship and symbolic motifs. And Victoria's homage to the subcontinent didn't stop here. of what would prove to be a procession of Indian servants. And they came across to be personal attendants to the Queen. The Indian servants were seen as exotic imports. They were beautiful, resplendent, standing beside the Queen. But the household did not exactly welcome them. one of the Queen's most hated servants. he became one of her closest confidants and friends. and made him into her close personal secretary. the rest of the household so much. she needed to inject a bit of excitement in her life. The Indian cooks weren't much liked either. had to accommodate their ways of working. in the way they deemed fit, and also whole spices. of grinding their own spices from fresh. so why on earth would these cooks from India need to grind their own? in the 1880s and 1890s. fired up the taste buds of the nation. to something that truly was fit for a queen. The same can't be said for the rest of the household. and that meant that everybody ate separately. This was the Queen's dining room. which she liked to eat. but they never had that curry. "of that rather fancy Indian chicken dish!" The relationship between royalty and Indian food continues today. to work with the royal family. Atul is one of Britain's top Indian chefs. when she entertained guests from the subcontinent. OK, guys. Get on with it. Thank you. as they prepared the menu for the state visit. Sea bass was one of the dishes. I was invited to cook this dish. and I cook it time and time again. So, let's make the sauce first. So, start with mustard seeds. And I also like to add a little bit of ginger. I got congratulated for my recipes. I remove the seeds, because they have all the heat. prioritising flavour rather than heat. so I took the heat out, and that way I have the flavour but not the heat. Coconut milk. And that goes in. And a large pinch of salt in this. Now, believe it or not, my sauce is ready. So, the masala mash, it's really easy. Same ingredients but different result. So, I've just added mustard seeds to the pan. Followed by a little bit of garlic. so whenever I'm cooking for them, the garlic is off the recipe. It's very simple. That's how you handle it. and a small pinch of turmeric. It's a really simple recipe. I must taste it before I set it aside. Beautiful. And that's looking really good. And we can go and pan-fry our fish. I'm pressing the fish down so that it remains flat and nice. and starts travelling towards the centre of the fish. that's the time I know the skin is absolutely crisp. I'll flip it over and follow the recipe beyond that. Just to double-check, I will lift it slightly and see. From here, I will need to add the mussels quickly in the pan. Four or five mussels will do. to serve on a grand scale. where you're feeding 300 people, so obviously, it's a conveyor belt. OK? And there are a large number of chefs helping you. You're not doing it alone. I think the fish is beautifully cooked. in the pan for a few seconds. And we're ready to plate. That goes right in the centre. A few mussels, you can put them aside. A mussel can rest on it. masala mash and a beautiful coconut moilee sauce. I was incredibly happy the way this dish went, the way people liked it. Atul went down really well. He's hot stuff, isn't he? He is. Atul is the spice master. -Right, what are you cooking? -Is this the one he learned from the Gurkhas? And we're going to cook a dish inspired by that. and it's fantastic and what happens, you get real deep flavour. see, all that is pure flavour. That's the sugars that come out of the onion. They caramelise and that's how the onions get nice and dark. -when he was serving in Afghanistan. So, we get that nice and blitzed up, so it's lovely and fine. -Cooked down. I do, I love it. -I'm a blitzer. Right, get that. That's really brown, those onions, aren't they? You might say burnt, we say caramelised! OK, so now we're cooking. and really kind of important to this dish is when we dry-fry the spices. can you see where the juices came out of the garlic and the ginger? See how now it's kind of just lifted that off? Takes it even darker. So, again, great base. -Have a smell of that. -Pity you can't get smells on television. Here, we've got an array of amazing spices. And the reason for that is spices contain oil. So, they dance. They come alive. And then you just let them cool and then blitz them again. We've got some asafoetida, we've got some beautiful clove. -I've never heard of that! -almost an onion sort of taste to it. Clove, which is really interesting in this dish. left to cool and then blitzed like that. So again, the flavours starting to work in this dish are amazing. -Yeah. It's gorgeous. But it's really good. -Aniseed flavour, like aniseed balls? Just give them a little nip to let those oils come out. we've got one beautiful base starting to come together. full of acidity, nice sweetness, they go straight in. So important in this type of cooking. Absolutely delicious. Get those all in there. I have to tell you, I'm not mad on goat. -I worked a lot in Africa and I ate a lot of goat. This is the shoulder, OK? We're going to add that straight in. and that's just again to get that lovely flavour. -So, we add that in. and things, but quite often, it's not lamb, it's actually goat. It's goat, yeah. Really mature goat. is because you've got so many flavours. so you need something that's going to hold its own. -Yeah, and a kid would be too delicate. With any recipes like this, don't drown it in water. You can add more but don't dilute that flavour. Could you do this with lamb as well? and when you're cooking like this, use those real working cuts. Shoulder and stuff like that. Legs, beautiful working cuts. Why do you call them working cuts? Because it's the part of the animal that works. Normally along the back are the tender cuts. so they're the things that need cooking longer. -Right, so that's everything in the pan. We're just going to put the lid on. -Get that in the oven. -Now, are they just showing off or is this really going to be hot? -Is it going to be a vindaloo? with the lovely chilli powder there. -Right, onto the side dishes. red onion, some nice green chilli, some garam masala. and nice temperature contrasts as well. It's as easy as this. because you don't want it to be sort of big chunks of red onion. OK? Just a light seasoning, all right? Not too much. -Why are you putting that in? -It's just a lovely spice, garam masala. -And it's a clean taste. -Really, really clean taste, yeah. And then, just, you know, you can get your fingers in there. For you, Michael, I'll be very polite. And just a nice, gentle stir. And what's that other dish you've got in front of your kachumber? the apple in there is delicious. That's an interesting variety on the usual raita, isn't it? -Right, shall we serve up? is our delicious goat curry. -putting that in the middle of the table. That is magnificent, and do you know what we'll do? We'll just finish that with some more fresh coriander. OK? And we're just going to now stir that in. Look at it. Honestly, it's incredible. -OK. Now, we're just going to serve up. Oh, my word. That looks good, doesn't it? Delicious, isn't it? Absolutely delicious. it's just cooked within an inch of its life. It should still have texture. -Would you like some kachumber? -I know you do, I know you do! Right. A bit of kachumber for you, Michael. OK? A nice bit of that lovely apple and mint raita. And there, we have my inspired version of the fiery goat curry. This is the first time I've had goat by choice. Nice different take on the raita with the apple. and cutting through it all. It's such a great dish. I have to say, Prince Harry has got good taste. available to British people as well as princes. to produce some of the best curries in the world. 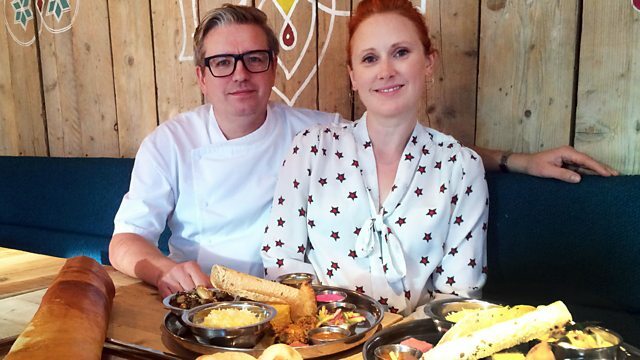 the driving force behind modern Anglo-Indian cuisine. This is the onion stock. This is just a little garam masala. but the food wasn't quite what Enam was used to back home. It was really different then. and the whole menu, 70% was all English dish. to suit British tastes, even inventing dishes. Then you're putting the tandoori masala sauce. that is creamy rather than spicy, perfect for the British palate. Chicken tikka is actually from Pakistan and Bangladesh and India. and then somebody said, "Put some tomato puree, put some cream. so that I regard this as a British curry. It's still number-one dish in the country. in a more recognisable way. The poppadom replaced bread and butter. they serve you bread and butter. So, they came up with the idea of poppadoms. is same as you maybe eat here a packet of crisps. is totally different than what I had, actually, back home. So, it was really shocking me. And Bombay aloo, a potato curry dish, replaced the chip. and they also may be asking for same question again. "Can't you find something spicy? Can't you find something different?" Bombay aloo was born and now, one of the fastest-selling in this country. And the onion ring became the onion bhaji. they come up with the idea of similarity of pakora. and make this together and making a big cricket ball. And put all the spices and everything in, making onion bhaji. they start selling in India. to the whole world is enjoying British curry. began to appear in the UK. one of the first to achieve Michelin-star stations. I can't run this restaurant without their contribution. to recognise people who contributed enormously. with 430 million viewers worldwide. with no South Asian heritage. when not being Indian is fabulous. of people's attention as well, which is great. for his work promoting Anglo-Indian curry cuisine. for contributing to the British Curry Award. The royal family definitely enjoy the real good curry. for a curry, they will come here for a curry. It's official, we're a nation of curry lovers. who inspired her own family as well as her people. who's a food historian who writes a lot about the royals. in particular Indian cuisine, Indian culture. Bertie, her son, and then his son George V.
came to adore Indian food. for the Empire in itself. Originally, he just hated the idea of leaving Britain, didn't he? "I've been abroad and it's not good!" -But then he went to India. and he and Mary travelled 9,000 miles, spent 18 weeks there. as the first monarch to visit India. He was the first Indian emperor. but not when it came to Indian food. to a lover of Bombay duck with curry sauce! and it was headed by the Colonial Secretary, Leo Amery. from the colonies and the dominions of the British Empire. It was an enormous publicity campaign for its time. "The jungles of today are the gold mines of tomorrow." Housewives were encouraged to cook for the Empire. in what you bought and cooked with. or Jamaican dishes or something else? focused their attentions mostly on the Empire pudding. is sort of stir it or steam it. They're not transgressing any boundaries there. -Not doing anything too dangerous! Look at this, Paul. This is the Empire Christmas pudding. "According to the recipe supplied by the King's chef, Mr Cedard,"
by "Their Majesties' gracious consent." The Empire Christmas pudding. Amazing! she was a kitchen maid at Buckingham Palace, as we know. which we got hold of, is the plum pudding, the Christmas pudding. on one side, it's the royals' plum pudding. And on the other side, it's the servants' plum pudding. -Well, this is the point. There isn't a difference except quantity. I mean, look how much more, you know! but the servants', it's got 40 pounds of beef suet, 40 pounds of flour. As a starter. There we are, Mildred Nicholls' plum pudding. So, what are your ingredients? which I love in these old-fashioned steamed puddings. All of them, they're absolutely fantastic. Demerara sugar, dark brown sugar, nutmeg. some rum and some brandy. And if you just look in there, what I love is the suet. Absolutely. Very simple, pudding basin. We've just lined it with some butter. So, we're just simply going to spoon this mix into here, Michael. because we don't want to create any air pockets. -It's really quite splodgy, isn't it? do it stage by stage, so we've got all that mix in there. -Well done, don't waste any. And then we'll put the string round. So, again, like a traditional steamed pudding. so it all cooks nice and evenly. -so it's not going to stick. Simply on top like that. Go push it on, so the butter then sticks to the pudding mix, OK? And then, just, this bit is really important. You don't want to allow any moisture to get in, or water to get in there. -Shall I hold it up? Yeah. If you can just hold it in place from the bottom. Like that, and then I'm going to... That's it. That's fantastic. -Put your finger on there. OK.
just to kind of elevate it, so the heat's going all the way around. sit it on top of the saucer, just like that. And it's about up to what level? -Basically, it's about a quarter full. Cos we don't want it to move, we just want steam. and that is just going to steam-cook for eight hours. even though the lid's on there. in the palace, wasn't it? I think they'd make as many as 150 of these things in the palace. -That's quite a production line, isn't it? Hats off, yeah. And you remember, that's all by hand. No machines or mixers, everything by hand. It's incredible. And that's going to cook for eight hours. -I'm not going to wait eight hours. -No, you haven't got to. Lucky for you, I've been slaving away. Yeah, yeah. And here it is. -Go on, cut it, Paul! Cut it. You are excited. Do you like puddings? -Right, we'll take a nice wedge. -You do that so well. Suety pudding stuffed with fruit. Stuffed with fruit. And do you know what else? -Well, did I need ask? -You're doing that with a hot spoon? Just so it comes off my spoon and goes up nicely like that. Tricks of the trade. Look at the presentation. I'm not going to look at the presentation for long. -I'm not going to look at it, I'm going to eat it. -Here we go. Are you going to have one? Got a real wedge of brandy butter. -Come on! Come on, you devil. -Go on. Get in there. Get in there! All the taste buds standing to attention, they are. There's something to be said for the servants' hall, you know. then they can have more and more of this. Oh, yeah. Mildred, happy Christmas! That's it from our celebration of food from India and the Empire. Michael Buerk is joined by chef Paul Ainsworth to celebrate royal food inspired by the days of India and Empire. Using recipes that have been hidden in the royal archive for over a hundred years, Paul cooks up quail and potato curry, said to be a favourite of Queen Victoria. Historian Dr Annie Gray visits Osborne House on the Isle of Wight where Queen Victoria, Empress of India, showcased her grand passion for the Raj, and even hired her own Indian chefs. Plus Britain's first Indian Michelin-starred chef Atul Kochhar cooks a dish fit for an Indian president and a British queen.